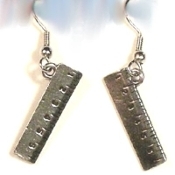 Funky Mini Pewter RULER EARRINGS - Tibetan silver-tone novelty charm costume jewelry, approx. 7/8-inch (2.19cm) Long x 1/4-inch (0.63cm) Wide. Great graduation gift for School Teacher, Principal, Secretary, Student, or anyone who wants to measure up!